Why Franchise Your Business | Is It a Good Idea? Most business owners think about franchising as a way to grow but I find most just don’t take the step to make the necessary changes. Over the years I have found there are a number of reasons. To do this topic justice, I have written two blogs, each covering four of the eight reasons business owners have given me many times over the years. This is Part One covering topics 1 to 4, part of topics on how to start a franchise. Click here to see Part Two covering topics 5 to 8. Why franchise your business? Many business owners think franchising is too complicated and that there is too much work involved in making the necessary changes. They believe they do not have the time or the skills required to run a franchise group rather than a single business outlet. These concerns are partly correct. Yes, there is work to be done to most businesses to make the changes needed to create a successful franchise group. But I have found most small businesses owners wishing to franchise need to think about their business in a different way. Most businesses have grown organically – adding services and products as they come to mind – resulting in a mixed bag of products, some more profitable than others. This mixed bag of products will not work well in a franchise because a franchised business needs to be very clear cut in what it takes to market successfully. I find most businesses need to simplify, often taking their business back to their roots – something most people find near impossible to do without clear-thinking outside help. Then once this is done, it is simpler to put the work in to convert to a franchise group. Surprisingly simple in fact. The franchising process itself is simple. Unfortunately, the traditional consulting model where you sit across a table and receive verbal instruction on what has to be done has made the process confusing. After 30 years in the franchise industry with experience as a franchisee, a franchisor and consulting to many of the big franchise groups, I know there are four very clear steps to get your franchise off the ground. And I know that if you take the time to learn about franchising through clearly presented workshops and documented actions you can get the job done in as little as three months if you are prepared to put the work in. Most business owners have the mistaken belief that they have to have their operations manuals in place before they start to franchise. And they find it near impossible to systemise a business they are still working in and which keeps changing. The thing is, to franchise, the first step involves looking at your business structure to divide it up into the multi-tiered franchise structure. You will be creating at least two new businesses from the one you now run – one for you as franchisor to look after your franchisees and another for your franchisees to look after your customer base. Through this process you will invariably simplify the part of the business which will go to your franchisees. Once you have you’re the right structure sorted, you will find it so much easier to write those elusive operations, especially with out help. We have experts to show you how or to do the job for you if you find that easier. We can give you guides and software to create operations your franchisees will love to use. Trying to document your existing business will often create systems which have to be redone when you start to franchise. If you are not systemised, we always recommend that you go into the franchising process first, so you are not wasting time doing the job twice which is regrettably what many people do. Most business owners, understandably are threatened by the thought of more legislation through the Franchise Code. They feel there is enough legislation around business already. This concern has only been heightened lately with the uncertainty of any changes which may come out of the Inquiry into Franchising about to be released. It’s a shame because most of the legislation around franchised businesses is really very simple and is there to protect both parties, the franchisor and the franchisee. What’s often overlooked is that this is a business partnership between franchisor (offering the brand, marketing and support) and franchisee (paying an initial fee and ongoing royalties from services they provide to customers). It is the franchisee who will generally bring in all the money to the group, providing profits both for themselves and the franchisor. Contractual arrangements like these need to be based on clear-cut legal structures or they will not work. Employing staff is hard enough so many business owners do not see how they can safely recruit franchisees who will have more responsibility. After all, franchisees will be running the whole business. And if they haven’t been approached by prospective franchisees, they cannot see that there is a market out there for great people who will do the job with love and enthusiasm. There is a way to find wonderful people and towards the end of your franchising process we can take you through the steps to get the best people possible onto your team. Check out Part Two of this blog if you have not seen it. 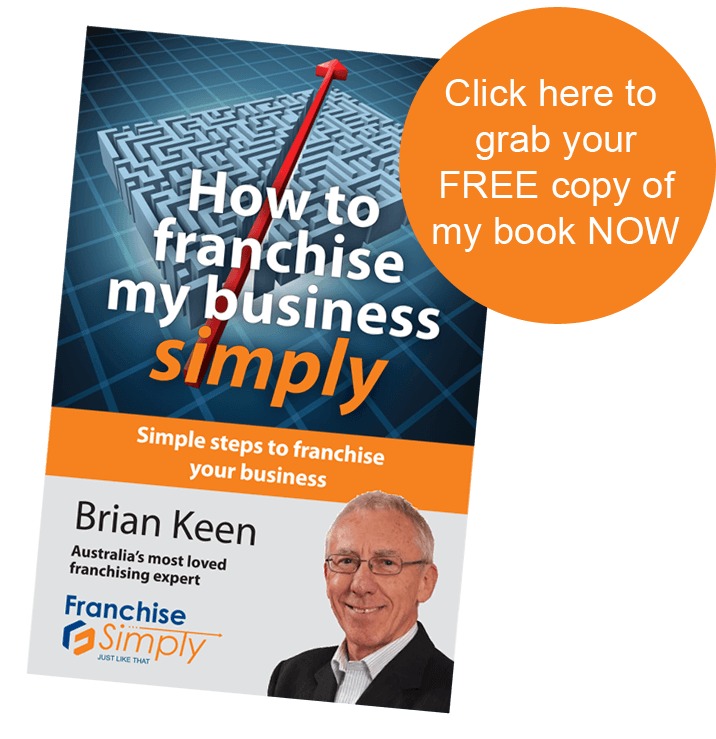 And to learn more about franchising, visit FranchiseSimply.com.au and get a copy of my latest free book, How to franchise my business simply and perhaps organise to have a chat with me or one of my expert team.